Why you might ask? 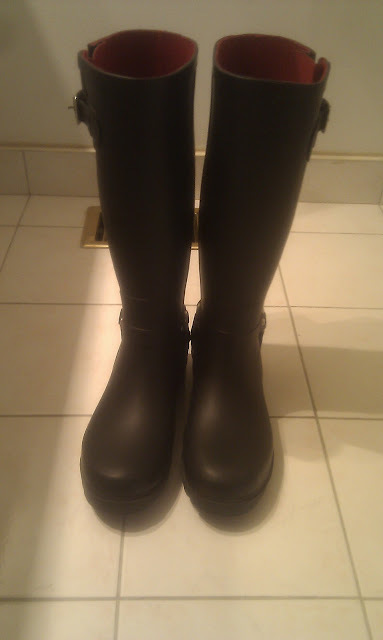 Because last month I finally got my rain boots! I had been debating whether or not I should invest in some since as a new grad I would no longer be walking all around campus. However, I realized that they would always be a good pair of boots to have on hand. So the search began for a stylish, affordable (my limit- $30, yup that's all I was willing to spend! ), durable, and comfortable pair of rain boots...it wasn't easy to find. Not only was I limited by my budget and muscular calves but I'm also extremely picky. 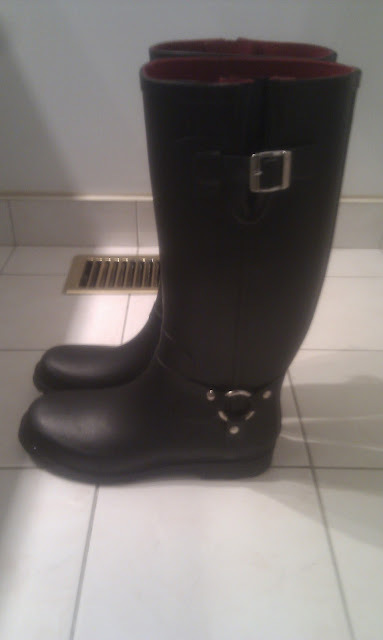 I didn't want a pair of kidish rain boots, I wanted ones that would go with everything. Love how they look like equestrian boots. I'm really lucky that my sister spotted these as they were not only the last pair left but also part of the sidewalk sale and I had a coupon!! I have been getting my money's worth out these boots as the weather gets colder. I'm glad I finally made the decision to invest in some rain boots. Outfit post coming soon!